This week, we headed to Pittwater Sports Centre to review their Kindygym Australia Kindy Recreation class (our review here), so we thought we’d checkout the centre’s Sand Bucket Play Centre and Café while we’re there. 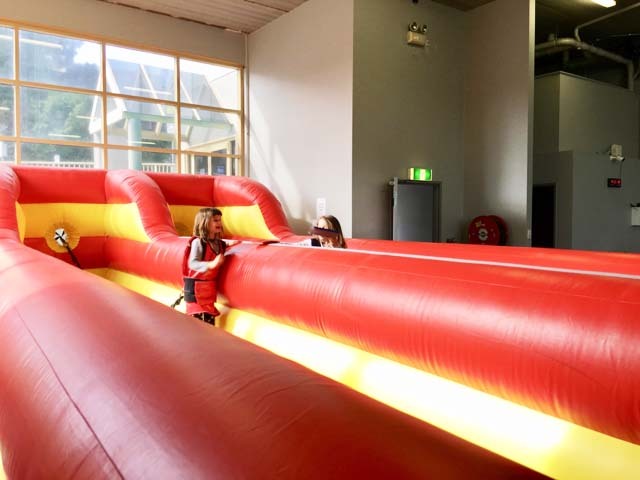 The indoor playground centre is perfect for a play before or after Kindygym class or perfect for a play with friends & family during the week or weekends or even for a birthday party (parties must be booked). It is fully air-conditioned with Free Wifi. 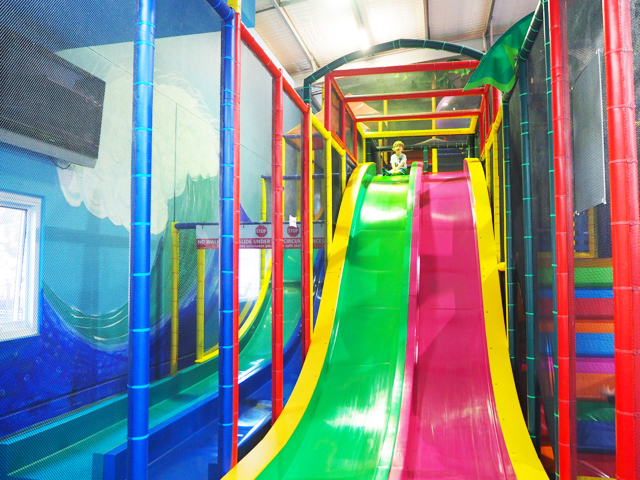 It caters for children 0 to 12 years old with various climbing areas, flying foxes and slides. The main structure for kids 4 and over has 7 slippery dips, 3 levels, 2 ball pits, 2 flying foxes, and loads of soft play equipment. There are also two areas for children 0-2 years and 2 to 5 years of age. Little Mister loved the challenging climbing areas of this indoor playground and had lots of fun, it was tricky convincing him to leave for his gym class - ha! There is also a baby area for little ones under 2 years old. Since there were no babies when we were there, little Mister had fun with the ball pit and surroundings. There is also a toddler area for kids 2 years and over which was lots of fun too but little Mister preferred the main structure. We look forward to visiting again and showing little Miss this great indoor playground. We had a nice bite to eat and a juice after little Mister’s class at the Sand Bucket Café, a great complex. The Sand Bucket Play Centre and Café is located at the Pittwater Sports Centre (PSC) at 1525 Pittwater Road in North Narrabeen. The centre and café are open every day at various opening & closing times so please check their website or call before you head there as they sometimes close earlier than advertised. PSC is a NUT FREE Centre. Children MUST wear socks when in the Sand Bucket Play Centre at all times. No food or drinks are to be consumed in the indoor playground. Parent supervision is compulsory at all times. Ensure the centre gate is locked at all times for the safety of all children. Baby change room and pram parking are located in the corridor. Toilets are located inside the gymnastics main area. Prices for play vary: Unlimited play for kids during the week for under 1’s is $5, under 2’s is $7 and kids over 2 is $10. Weekends are charged at $10 for all ages. Ask for their 5 or 10 visit passes to save. You can also save on entry when your child is signed up to the Pittwater Sports Centre’s Kindygym program. Busy City Kids were hosted by The Sand Bucket Play Centre and Café for the purpose of a review. Food and travelling costs were self funded. All opinions & feedback are genuine & truthful. For more information on The Sand Bucket Play Centre and Café, head to their website. We loved reviewing Wannabees Frenchs Forest so much last November that we wanted to checkout Wannabees’ second centre in Hornsby too. The Wannabees Hornsby centre is a newer version of the Frenchs Forest centre which is jam packed with many rooms to explore like a supermarket, vet, grocery shop, radio and news room, hairdresser, fire station, a dance floor, the list goes on! The kids loved everything about this new centre and especially the grocery shop, hospital and post office. It’s easy to spend hours there visiting all the different rooms. Some rooms are opened at different times so make sure you checkout the schedule. The vet centre is also a favourite with my kids, they love taking care of sick pets and giving them a bath. Little Mister particularly liked the babies’ room which includes soft play equipment. Kids can take part in reading the news, interact in different movie screens, take their turn in the radio station, get their hair ready, dress up in the dressing room for a dance off on the dance floor. Little Miss and her brother also loved pretending to cook and serve up food to us at the pizza café and taking their turn to hose fires down at the fire station practice spot. There’s also a medical centre and nursery room as well as a post office where kids can pickup letters and parcel to deliver around the centre. Lookout for letterboxes in front of each shop. There’s also two party rooms and a restaurant onsite. 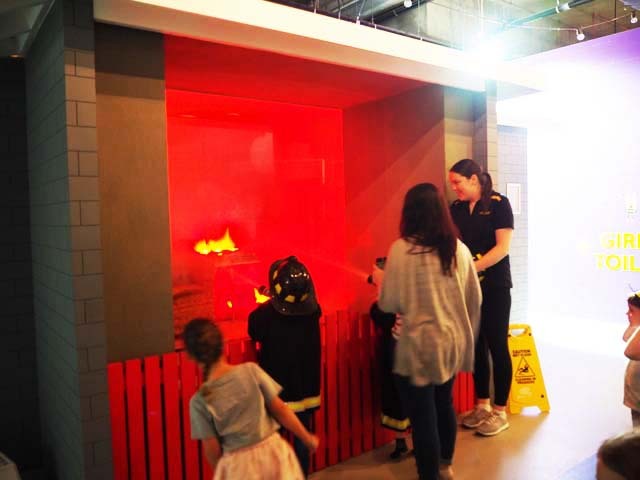 We really enjoyed visiting Wannabees Hornsby late last year, it’s a cute centre for birthday parties, catchups or a simple play. Kids will be occupied for hours exploring all the rooms! Wannabees Hornsby is located at Shop 2042/236 Pacific Hwy (inside Westfield Hornsby opposite Fernwood Gym). Open Monday to Friday (9:30 am - 2:00 pm), Saturday 9:30 am - 5:00 pm and Sunday 10:00 am - 5:00 pm. Adults $5, Children Weekend & school hols: $15 (1-2 yrs) or $20 (Ages 3-10). Otherwise $15 for all ages weekdays during school term. Kids under 12 months free. Head to Wannabees Hornsby during the week or early to avoid the crowds. Scheduled activities are on every weekday morning between 10am and 1pm to keep everyone entertained. On weekends fashion parades are run, disco dance on our concert stage, Tv Studio and the popular “fire fighting” several times during both morning and afternoon. Also open for birthday parties, school excursions or vacation care and café onsite. Busy City Kids were invited to Wannabees Hornsby for the purposes of a review. All opinions & feedback are genuine & truthful. Food and travel were self funded. For more information on Wannabees Hornsby, head to their website. To checkout our review of Wannabees Frenchs Forest, head to our review here. We Rock the Spectrum provides a safe, nurturing, and fun environment to foster learning, exploration and safe sensory experiences. They are committed to providing children with a fun and motivational environment to help them in the areas of strength, movement, sensory processing, communication, positive behaviour, social interactions, and self-care skills. Their unique equipment assists all children in their neurological growth and development which can help all children grow, develop and feel connected by providing an inclusive environment for play. Parents/carers and children can pop in to the WRTS centre and enjoy full use of their sensory-safe gym. Their gym features fun therapy equipment, sensory play, an arts & crafts area, a really nice sensory wall, a calming room and more. There are a range of activities available for kids ages 1 to 12 years. WRTS have a fantastic range of toys in the toddler section from Melissa and Doug and The Therapy Store for little ones to use. Older children can jump on the trampoline or zip down the zip line and swing on a variety of swings. We Rock the Spectrum can also host birthday parties, special events, excursions, classes and more. They also have a fantastic The Rock Shop offers parents the best selection of hand picked sensory-based toys and puzzles. Busy City Kids were not invited to We Rock the Spectrum however we thought it would be beneficial to our readers to read our review of the venue. All opinions & feedback are genuine & truthful. Food, travel and parking were self funded. For more information on We Rock the Spectrum HQ in Preston, head to their website. We Rock the Spectrum (WRTS) Preston are open Mon-Fri: 9:30am–6pm, Sat-Sun: 9:30am-5pm. WRTS Preston are located 378-380 Gilbert Rd in Preston VIC 3072. A range of play opportunities are offered at WRTS such as open play, birthday parties, special events, therapy services, NDIS, Parents Night Out, Excursions as well as Music Classes, Yoga, Storytime, Art Classes, Dance and more. For children ages 1 to 12 years, Open Play Time is offered daily, Sessions are for 2 hours, Siblings are discounted, An All Day Pass with pass outs is available and Multi-visit packages and Monthly memberships are available. A parent or guardian must be on the premises at all times. Prices for Open Play are $14 for 1 Child and $12 for Accompanying Sibling for 2 hours. An all day pass is $24. There are Open Play discount packages and monthly memberships available too. Check their website. FREE off-street parking available at the rear of the building. 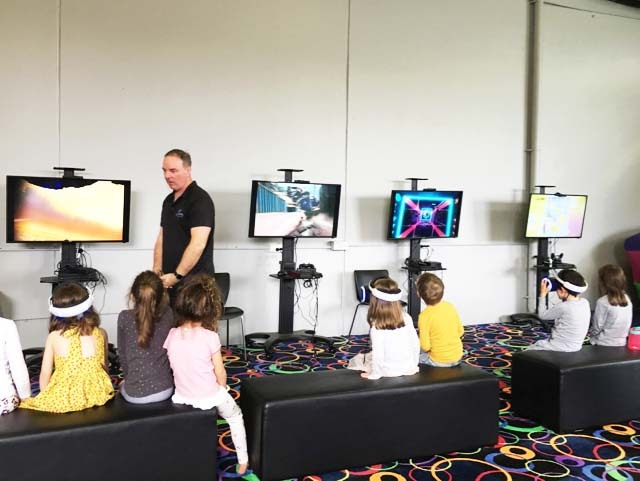 We recently visited Wannabees Frenchs Forest before the school holidays and had a great time! Kids really enjoyed spending time at this child size city. The 1100 sqm building comprises of a beauty salon, grocery store, vet office, café & restaurant, post office, bank, doctor’s office, school, library, jail & police station, maternity ward, radio & tv studios, fashion shop and a construction site. Children can dress up, role play and pretend to be a doctor, postman, fireman, vet, beauty therapist and much more! Little Miss’ favourite spot was the beauty salon where she pretended to get her hair done and had her nails painted by one of the staff. Little Mister and Miss’ other favourite rooms were the grocery store, pet shop, jail and the café & restaurant. They loved pretending to give dogs a wash at the vet’s salon and making coffees & food at the café/restaurant. The kids loved pretending away in the green screen room and even dad joined in for a news presentation! Little Mister loved taking the little tikes cars and other cars available onsite for a ride around the centre. 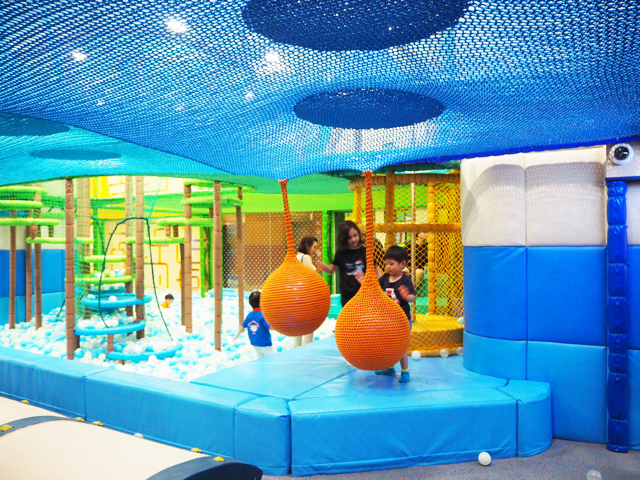 Kids can also enjoy a play zone with toys, a small climbing structure and climbing wall. They can also take part in fashion shows and dance on the special dance floor. Wannabees Frenchs Forest is a very popular spot for birthday parties on weekends so book in advance. The kids really enjoyed their visit at Wannabees Frenchs Forest and have asked to go again soon. A great spot for a play date, birthday party and perfect for rainy days. Wannabees Hornsby, the newest centre is now open and we hope to review the centre very soon. For more information on Wannabees, head to their website. Busy City Kids were invited to Wannabees Frenchs Forest for the purposes of a review. All opinions & feedback are genuine & truthful. Food and travel were self funded. Wannabees Frenchs Forest is located at C1/1-3 Rodborough Rd in Frenchs Forest. Head to Wannabees Frenchs Forest during the week or early to avoid the crowds. Little Miss was recently invited to a birthday party at Rock House Climbing in Brookvale and was very happy to join her friends, an instructor and the father of her birthday friend to start the climbing lesson as soon as possible and eager for me to leave as a result ha! Kids 3 years+ can participate at Rock House Climbing. The instructor lets the kids know about their harness, safety instructions, what they will do and the plan for the party and breaks. Kids will do a series of climbs whether it be a wall climb or climbing up a ladder all while being assisted by an instructor. Once the climbing session is complete, kids can head upstairs for a self catered or pizza party and enjoy birthday celebrations and cake. Little Miss had lots of fun and wants us to throw her a Rock House birthday party next year! Checkout their website below for more information and pricing. 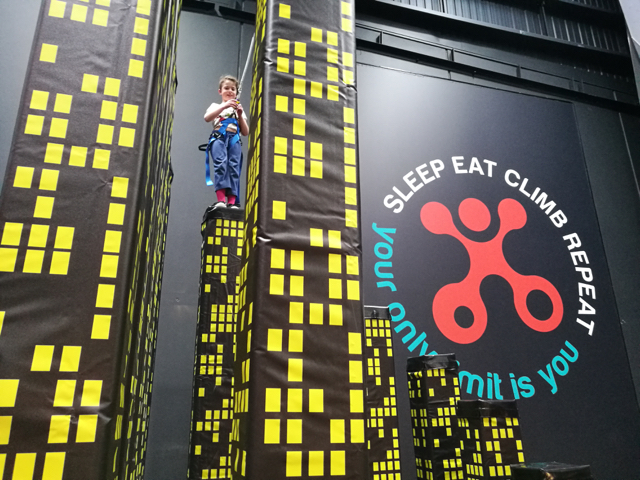 Busy City Kids were NOT invited to conduct a review at Rock House Climbing however we thought we would share our experience at this birthday party venue to provide ideas for parents for their child's birthday. For more information on Rock House Climbing, head to their website. A few weekends ago, little Miss was invited to a friend's birthday party at Stomping Ground in Brookvale. 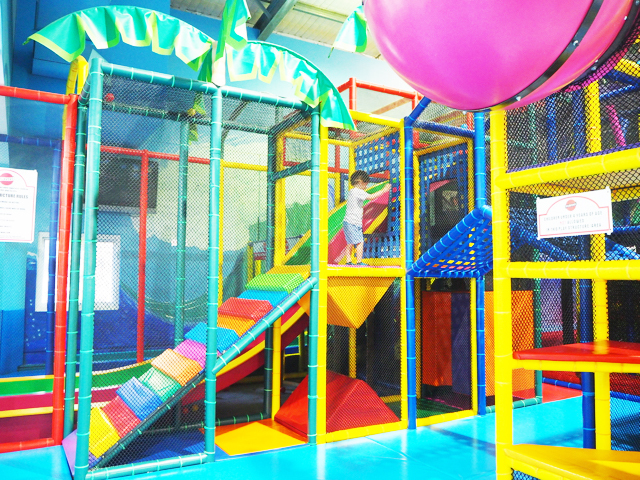 This indoor play centre is great for little ones under 5 during the week and kids between 6 and 12 years old on weekends for birthday parties and school holidays. Kids can burnout some energy celebrating their friend's birthday party by playing upstairs on the interactive magic floor, Foosball and Air Hockey tables while they wait for their party to start and head downstairs with supervisors and jump, climb and compete in the inflatables and finish off with a virtual reality session, have a snack and celebrate with the birthday cake. Little Miss loved going through the inflatable obstacles and going down the large slides, climbing the inflatable mountain, competing warrior style and knocking friends over in gladiator knock out and more and loved doing virtual reality too. The setup is great as parents of children attending the birthday party can drop off their child and be confident that they will have fun and be in safe hands with the supervisors at the centre. Parties run on Saturday and Sunday for 2 hours. For more details, head to the centre's website (link below). Stomping Ground are also open Monday to Friday from 9am to 1pm during school terms for little ones under 5 to enjoy soft play. They also host Little Stomper birthday parties and special events from 1pm. Looking forward to reviewing the under 5s session soon. I know little Mister would love it! 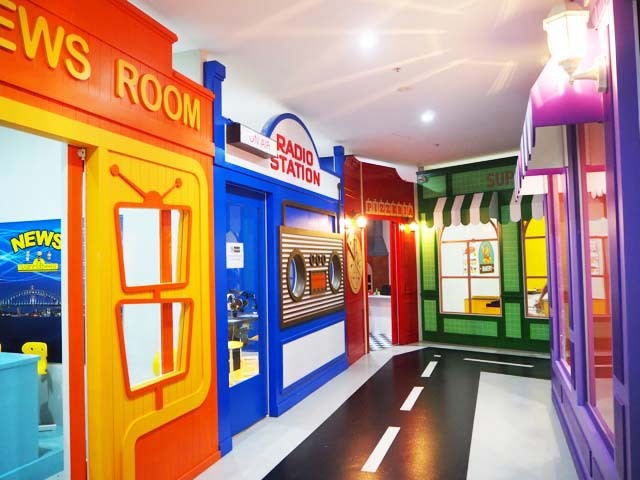 Busy City Kids were NOT invited to conduct a review at Stomping Ground however we thought we would share our experience at this indoor playground for parents with little ones under 5 and parents of kids over 5 for birthday party venue ideas. For more information on Stomping Ground, head to their website. 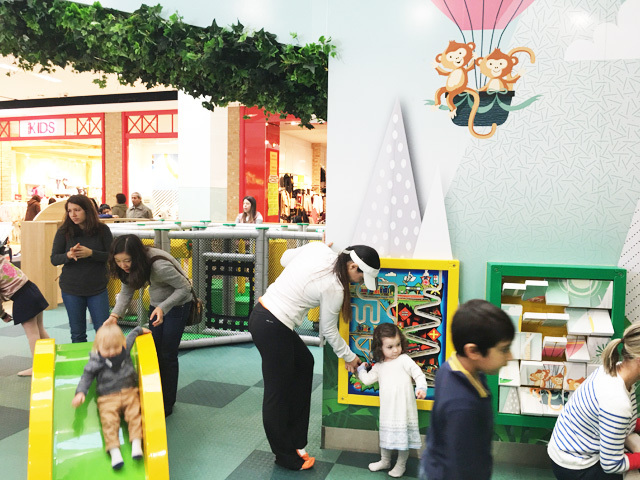 The Harbourside Shopping Centre at the Heart of Darling Harbour recently opened its first interactive playground, Caterpillar Lane. Over 40 metres long, Caterpillar Lane comes complete with interactive digital panels, climbing towers, slides, light, projection games, as well as a special soft play area for children four years and under. Busy City Kids were invited to review this playground however we have not been able to make it to as yet since its opening. We hope to visit soon, in the meantime, here's some pics and text from Harbourside. Thanks guys for sharing this great indoor playground! 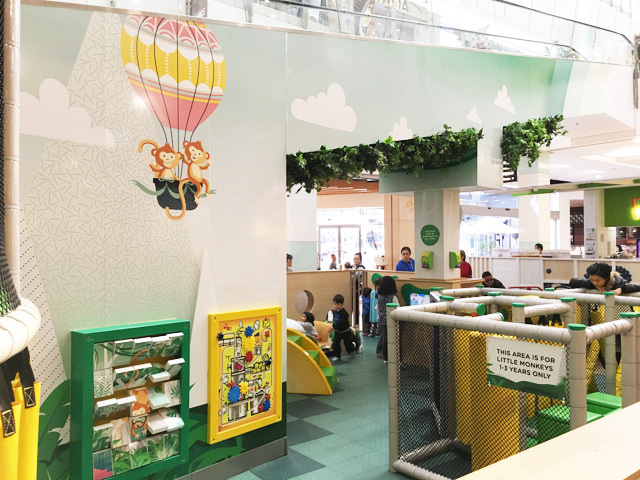 Located on Level 2, this unique play area is for little ones between the ages of 1-8, and has been separated into three sections - starting at a friendly giant caterpillar head overlooking Level 1. The head of the caterpillar, for children between 4-8 years old, is a soft play structure across multiple levels filled with gross motor play events, including integrative gadget panels of Cat & Mouse and Walk Around Zoo; a spider bungee; jumbo slide; triangle deck climb; along with lots of space for little legs to run amuck. The body of caterpillar is a colourful arch focusing on interactive games projected onto the floor. Four interactive touch screens are placed around the base of the caterpillar providing endless hours of fun for children between 1-8 years old. The tail of the caterpillar is for ages 1-4 years, complete with six interactive gadget panels, including classics Tic, Tac, Toe, Cat & Mouse and Mix & Match; a safari play car; a butterfly play slide; triangle deck; spider bungee and more. 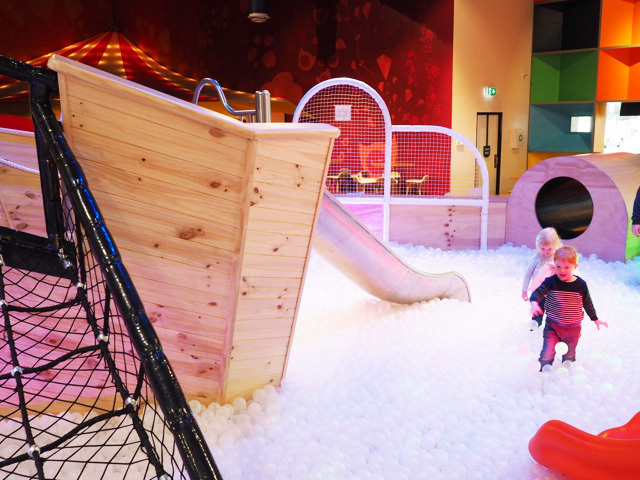 This new children's interactive playground is over 40m long so it includes lots of wriggle room for your little ones. 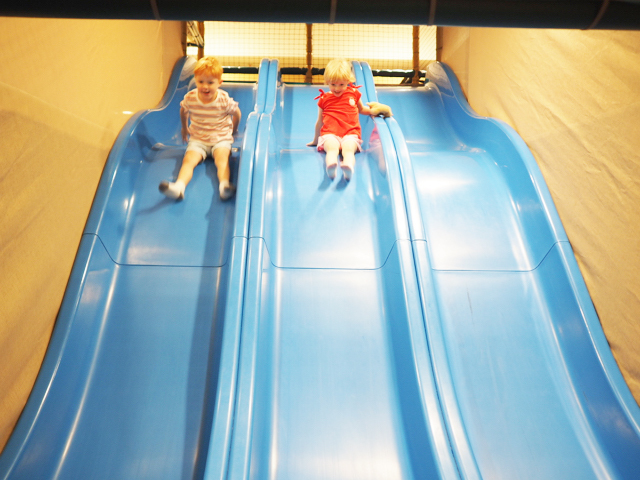 It has soft play areas, climbing towers, slides, as well as interactive panels and light projection games. Best bit, entry is FREE!! Caterpillar Lane is located on Level 2 of Harbourside Shopping Center above the main Food Court. For more information on Caterpillar Lane, head to the Harbourside website. Kate and her little ones popped in at The Little Village Play Café last week and enjoyed a morning of play, food and some quiet time. A great option for little ones and their carers. Thanks Kate for the great pics and review x Catherine. To follow Kate's adventures with her little ones, head to her Insta page. 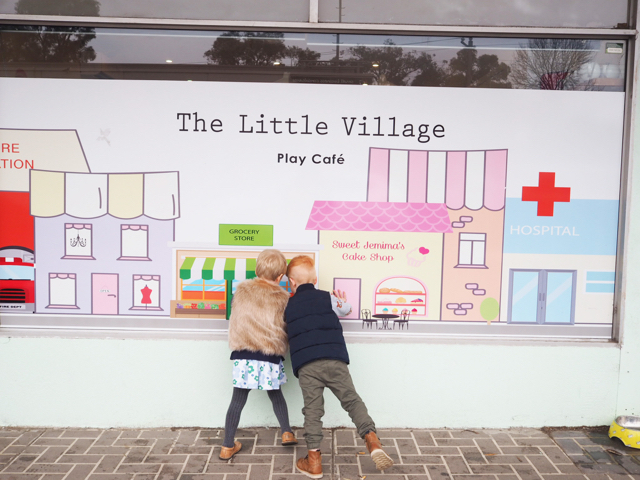 The Little Village Play Café is a relaxed space that is perfect for local parents & carers of preschool aged children to come and enjoy a hot coffee and bite to eat, while their little ones play in a safe, fun and stimulating environment. New owner Karen (who is a mumma of four + grandmother to EIGHT!) recently took over the business in June and with the help of daughter, Samantha have made a super cute ‘little village’ play area with Fire Station, Grocery Store, Hospital, Cake Shop and Boutique. Each offering children lots of toys and props for imaginative play + a selection of dress ups to help look the part too. There is also an area deigned especially for crawlers to explore and a library filled with books and a circus tent for little ones wanting quiet time. While the children play, adults can sit back and relax in the café that ensures you can always see what your little explorer is doing. From the café you can grab simple snacks (think toasties, fruit skewers and cupcakes) as well as a selection of hot and cold drinks. Note: no outside food is allowed except for baby food and formula. The Little Village Play Café also host birthday parties and run children's activities such a story time, craft and music classes during the week. They will soon be starting crafts every Tuesday & Thursday at 11:00am, baby chino Tuesday where kids get a free baby chino with every paid entry and Grandparents only pay $5 for grandchild entry Monday to Friday. Busy City Kids were invited to the Little Village Play Café for the purposes of a review. All opinions & feedback are genuine & truthful. Food and travel were self funded. For more information about the Little Village Play Café, head to their website. Pop in to the State Library of Victoria to enjoy the latest Play Pod theme and join the Library for Indigenous art and storytelling activities, inspired by Aunty Joy Murphy and Lisa Kennedy's Welcome to Country. How gorgeous is this new theme, love the little fire and the cute cushions! An Aboriginal ceremony of Welcome to Country is depicted for the first time in a stunning picture book from two Indigenous Australians. Welcome to the lands of the Wurundjeri people. The people are part of the land, and the land is a part of them. Aboriginal communities across Australia have boundaries that are defined by mountain ranges and waterways. Discover Welcome to Country through the book and Play Pod. It will be the last Play Pod for a while as renovations will be underway after September to prepare and to build an amazing new space for children and families, the Children's Quarter due to be complete by end 2019. The Play Pod is open 10am–4pm daily in the State Library of Victoria's Courtyard and will close on Sunday 19th of August 2018. 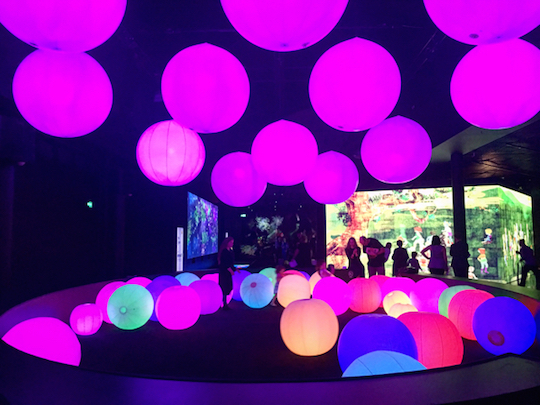 For more information on the State Library of Victoria Play Pod, head to their website. 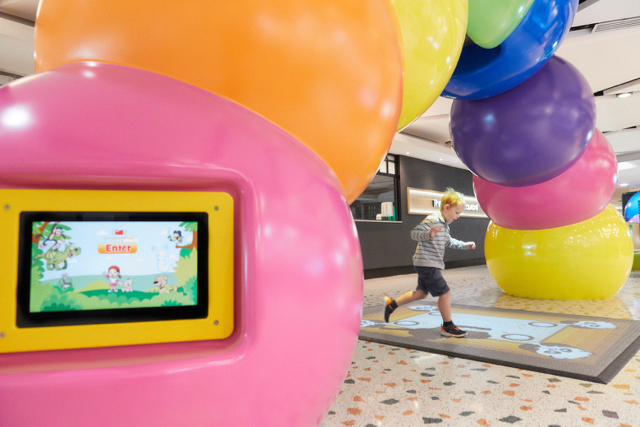 Baby Bounce and Story Time Programs will be suspended during renovations however keep in touch with the State Library of Victoria as offsite programs will take place. The last dates for these programs will be Thursday 16 August, and the Play Pod will close on Sunday 19 August, 2018. To read our past reviews of the Play Pod, head here. Kate's little adventure seekers were invited to Funtopia Maribyrnong this morning to test out the NEW Fit & Fun for Mums, Dads & Bubs program. They really enjoyed this great new program for little ones 4 years and under. The super helpful staff gave some tips to Kate's little Arlo which made him a super quick climber across the center and also enjoyed climbing with his dad. Little Macy was hesitant at first however with the help of staff was able to gain confidence and climb without a rope on small sections of walls. Turns out she's also a great little climber and will try using a rope to climb higher next time. Both had a fantastic time at Funtopia Maribyrnong and could have stayed there for an easy 3 to 4 hours. Thank you for the great pics and highlights Kate xo Catherine. Follow Kate's adventures at @kateflatman. Fit & Fun for Mums, Dads & Bubs Sessions allow little ones 4 years and under the opportunity to explore Climbing World’s interactive climbing walls with their parent/carer. Climbing World is usually only open to over 4’s. Specially sourced safety equipment, including baby and toddler harnesses provide parents with peace of mind for safety. Supportive coaches are on site to help adults and children & guide you through the different climbing walls. Make sure you press the red buzzer when you get to the top to let everyone know you’re an awesome climber! Includes FREE access to Playground World after the Fit & Fun session concludes at midday. Fit & Fun takes place Monday – Friday from 10am to 12pm. Available during the school term only. No bookings required. Come anytime between 10am and 12pm. $18.50 per child. Mum (or dad) included in price. Includes FREE access to Playground World after the Fit & Fun session. Start in Climbing World to maximise your time before the session concludes at midday. You can then have some lunch and then stay and play in Playground World for as long you as like, well until the centre closes! All climbers must wear closed toe shoes. Socks are to be worn inside Playground World. Grippy socks are available to purchase & make exploring the playground even more fun! The motorised car ride upstairs in Playground World takes $2 coins, so come prepared or ask reception for change. No outside food or beverages are permitted with the exception of baby food and children’s drink bottles. The onsite café, Mr Spriggins offers a wide variety of delicious (+ healthy) food and drink options. 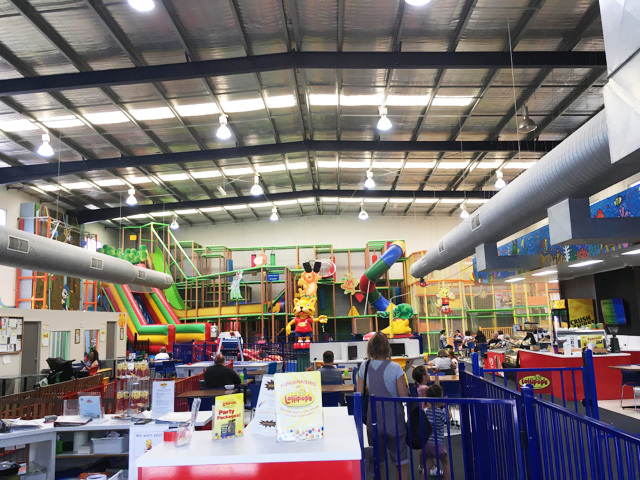 For more information on Funtopia Maribyrnong, head to their website. 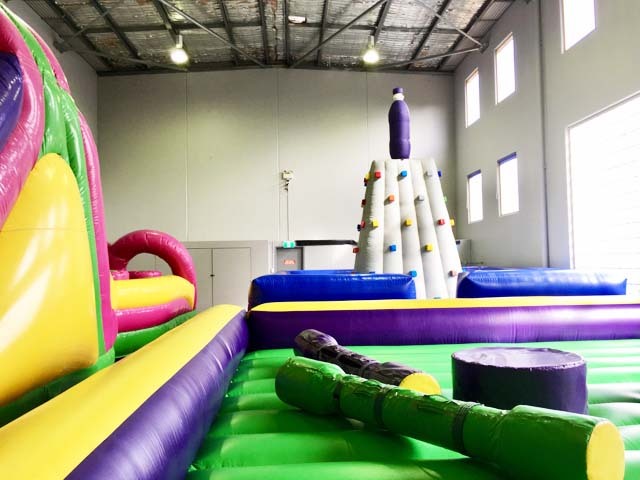 Busy City Kids were invited to Funtopia - Fit & Fun For Mums, Dads & Bubs at Funtopia Maribyrnong for the purpose of a review. All opinions & feedback are genuine & truthful. Travel and food were self funded. 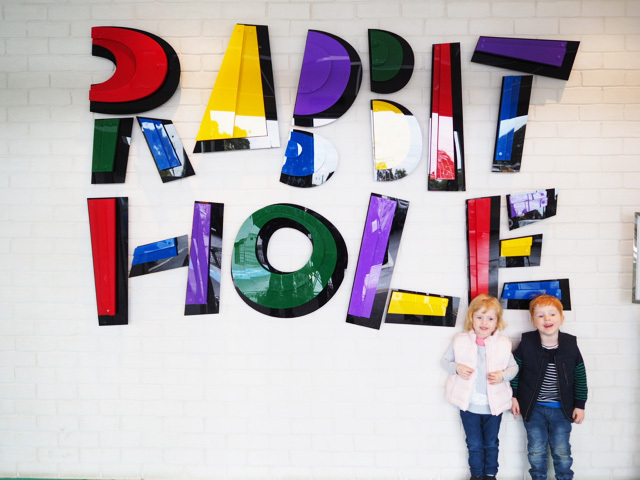 This week Kate and her experienced little reviewers took on the Rabbit Hole Kids Playcentre in Braybrook. Judging by the photos and from what I heard from Kate, her little ones had the best time climbing everything in sight, going down every slide, playing in the ball pit and experiencing the centre to the maximum. They stayed at the centre for under 4 hours but could have easily fitted an another hour in there! The verdict - a big thumbs up from the whole family including Kate whom I hear took down a few slides herself ha! Thanks for inviting us Rabbit Hole Kids Playcentre. Thanks Kate for the perfect pics and review xo catherine. Here's Kate's highlights. To follow Kate and her little ones, head over to their Instagram. Entering the Rabbit Hole and seeing the tall, wooden boat and massive, glowing white ball pit. Climbing through the tunnels and up/down the hull of the boat. Enchanted Forest - Exploring up high on the forest canopy through the treetop walk. Climbing the huge interlinking rope playground and having many turns on the bumble bee slide! Space World - Chasing each other through the large climbing structure (which has direct access to the party rooms!). Sea World - Watching older children climb the rock wall (minimum 20kg weight restriction). Slipping and sliding through the interconnecting villa huts playground and slides. There are trained staff providing general supervision throughout the centre. Lots of seating for adults to enjoy a coffee while they watch their little ones playing. Rabbit Hole Kids Playcentre is located at shop 13/227 Ballarat Rd, Braybrook, Melbourne. Rabbit Hole Kids Playcentre is open daily Monday to Friday and Sunday 9:30 am to 5pm, Saturday 9:30 am to 6pm and Public Holidays 10 am to 5pm. 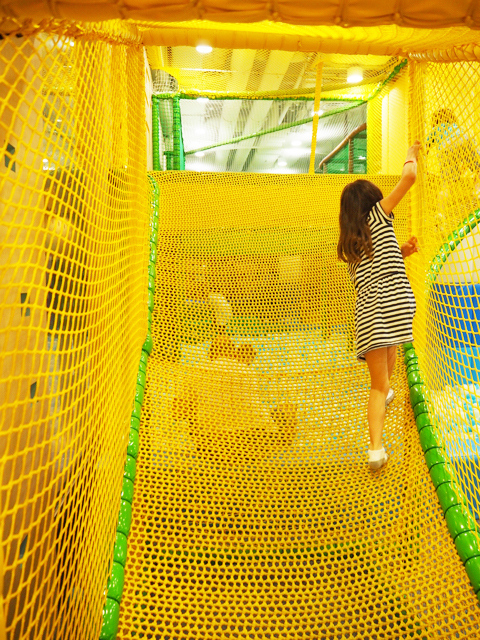 Little kids and big kids (adults) of all ages are welcome to play at the center. A soft play area at the Funfair for 3 years and under. Entry prices vary according to your child’s age and whether you are visiting during the week or on the weekend. These prices allow your little ones to have unlimited play all day. Be sure to ask about Mother’s & Father's Group specials and 5-Pass Packs; they are a great way to save money if you plan to visit often or with a group. No outside food or beverages are permitted with the exception of baby food and children’s drink bottles. The onsite café offers a wide variety of delicious (+ healthy) food and drink options. All visitors are required to remove their shoes and wear socks before entering. All outside footwear must be stored in the designated shoe cubbies provided. Socks are also available for purchase if you forget to bring your own. Rabbit Hole Play Centre is the perfect venue for children’s birthday parties with several different party options to choose from. The Bakehouse Cooking School and Disco Room packages look particularly fabulous! Stuck for a birthday present? No worries, Rabbit Hole Play Centre sells Gift Vouchers too. Woo hoo! Rockwall Climb or Bakehaus and Funfair special programs are at additional costs. Prams are permitted but parking prams is recommended. Pram wheels will be cleaned on entry. For more information about Rabbit Hole Kids Playcentre, head to their website. Busy City Kids were invited to the Rabbit Hole Kids Playcentre for the purpose of a review. All opinions & feedback are genuine & truthful. Travel and food were self funded. 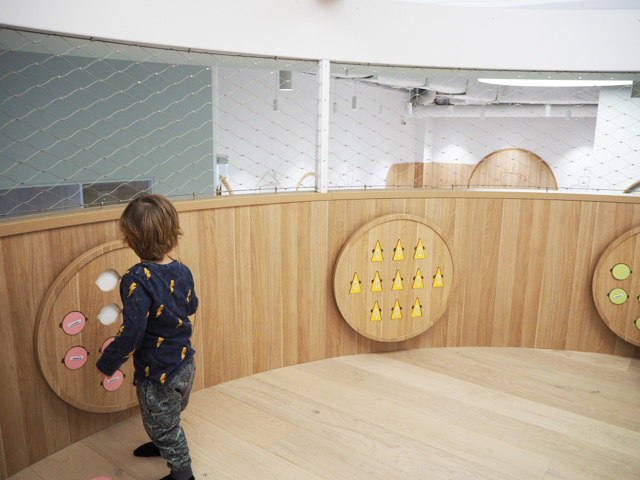 This week, Little Mister and I were invited to experience the brand NEW NUBO Chatswood centre in Chatswood Chase! We have been looking forward to visiting NUBO Chatswood since July 2017 when we visited NUBO Alexandria (our review can be found here). And it was everything we imagined and more - such a gorgeous center, we loved the way it made us feel and allowed us to relax, play and learn! As soon as you walk towards NUBO Chatswood, you notice the beautiful design and attention to detail the owner and designers of NUBO have gone through to bring this second center together. 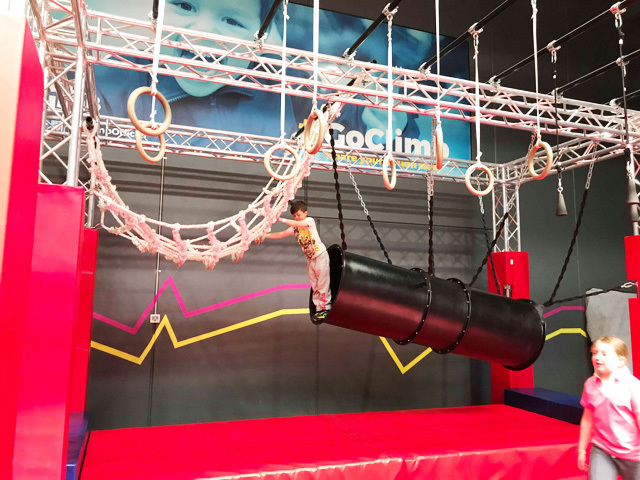 NUBO meaning cloud, was created by owner and mother Mollie Li who came up with the idea of the center when she first moved to Australia and felt there was no play centres where she could interact with her child through play. 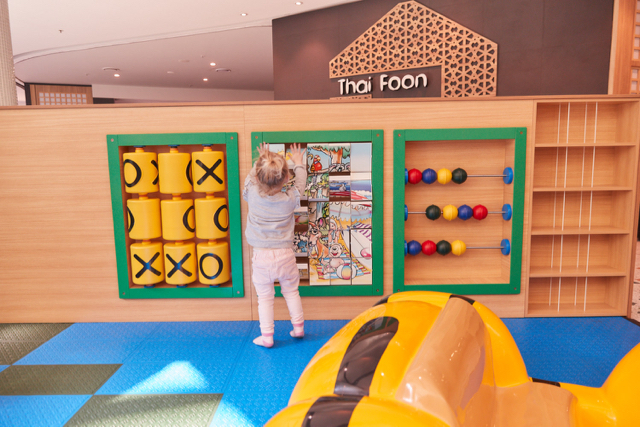 Owner Mollie Li's focus is on learning through play and doing so in a space which promotes a relaxed environment, where parents, carers and grandparents can learn and play with their children. While the concept is the same, NUBO Chatswood differs slightly to NUBO Alexandria due to its main focus and size. NUBO Chatswood is aimed at children 0 to 6 yrs and its core focus is on providing educational workshops at different times during the day covered by a selection of specialists in their specialised field (art therapy, design, performing arts, music, dance, early years’ education, health and wellbeing). At other times of the day, workshop rooms are setup for play and puzzles, dancing & gym and drawing. We loved playing with the funny texture of moulding goo while overlooking the play area. Once little Mister got a glimpse of the play area and a little truck, there was no stopping him from going there and he loved it so much that he did not want to leave and I literally had to pull him out of the area screaming when we needed to go as he was having so much! It is such a gorgeous space to play in, who can blame him! We saw parents and carers interacting with children, taking part in play but also allowing children to be self sufficient and letting them explore the new space. Little Mister loved going down the very fast slide and found himself on the ground a few times but the soft ground cushioned his fall. Boys are certainly very adventurous! He especially loved the little market & café area where he played pretend shop for ages and enjoyed playing along with other kids too. We enjoyed two workshops on the day one about Science and the other about Music. In the Science workshop, we learned about the lifecycle of a frog and created our own lifecycle from egg to frog! In the Music workshop, we did some warm up dance exercises and sang & danced along to songs with the instructor on the guitar. From the end of May, workshops will be segmented into age groups to ensure each child gains the most value from the workshops so watch out for those. At different times during the day, there are story time sessions in the tree house and the sensory room is open for kids to explore. The sensory room is a special room for little ones to experience different textures, feelings through special lighting, music, and objects. Little Mister loved playing with the animals in the kinetic sand, playing with the leaves and wooden peddles, checking out insects through the microscope but most of all playing in the special sink with the clouds and water suction objects. Do pop by the onsite café while you're there. Little Mister and I had a babycino and a tea however he was quick to finish his and run back to the playground, leaving me behind but I was able to move to a table right on the edge of the playground behind the fence where I could see him play and enjoy my tea at the same time. There is a parents room available for parents to use for feeding their children as well as Unisex toilets available for parents and children to use with a change table and a very cool cloud mirror and rain for water to use to wash your hands! We loved visiting NUBO Chatswood and couldn't recommend it more and being closer for us, we will sure to be back soon! Note: Having only been opened for two weeks, it is our understanding that it is early days for NUBO Chatswood in terms of how the center will operate. Recent feedback from the public regarding the Chatswood Family Club has meant that NUBO is looking into being more transparent about the way they will operate forward. We have provided our own feedback regarding workshops durations and along with public feedback regarding casual visit, casual play, workshops, child minding service and family club membership, we hope that NUBO Chatswood will come up with something that works for everyone and where everyone has access to this wonderful center. Checkout Nubo Chatswood's What's on page on their website to see the current theme and what workshops and activities have been planned for the day. NUBO is located on level 2 next to KidStuff shop. There is ample parking at Chatswood Chase with 3 hour free parking. Arrive as Nubo opens before the crowds arrive so you can enjoy the space alone. Bring socks for the kids and yourself preferably non slip socks with grips underneath as the centre does not allow shoes for adults and children (even in the toilets) so bring your socks with you on the day. 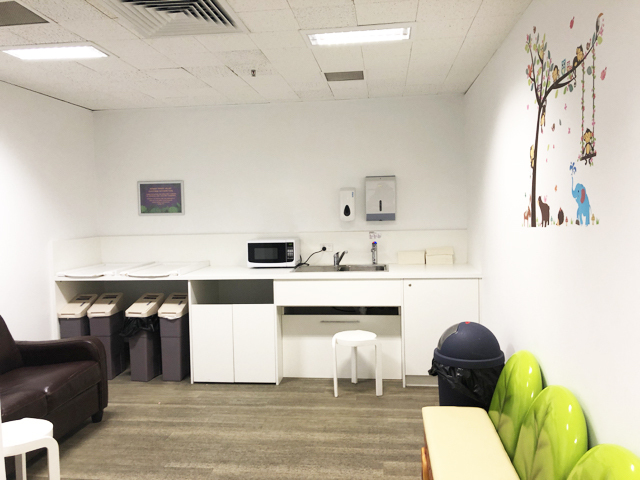 The centre caters for children 0-6 years and is open 7 days at various times, checkout NUBO Chatswood website below for more info. Prices vary depending on the day you visit, how long you stay, workshops booked so checkout the Visit page on their website. There are unisex toilets onsite with a change table as well as a parents room. Outside food is not allowed at the café so keep your snacks for when you leave the centre or treat yourself to a coffee and a snack from the café. To find out more about NUBO Chatswood, their program and where they are located, head to their website. To read our past review of NUBO Alexandria, head to our review here. 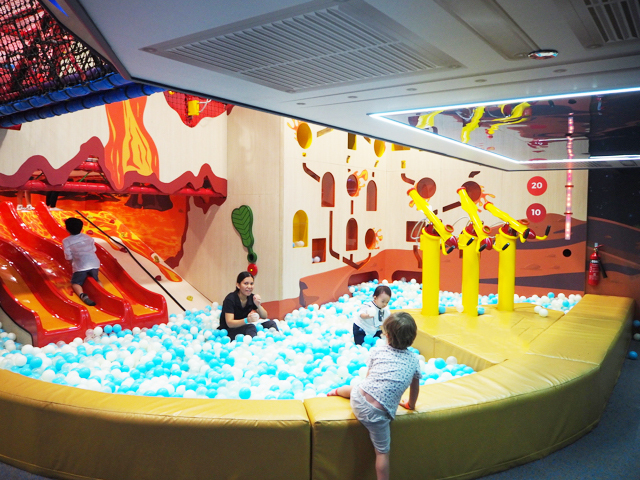 Busy City Kids were invited to NUBO Chatswood in Chatswood Chase for the purposes of a review. All opinions & feedback are genuine & truthful. Travel and fee paying activities were self funded. When researching places to experience in Singapore, I stumbled upon Buds by Shangri-La and knew I had to take the kids there! The kids' face when we entered Buds and they saw that ball pit and the gorgeous place was priceless! They had the best time and didn't want to leave but after more than 2 hours, I was the one feeling tired ha! We did not have time to see the outdoors area which is a shame as it looks fantastic! Thank you to Buds for inviting us - what an amazing play space! 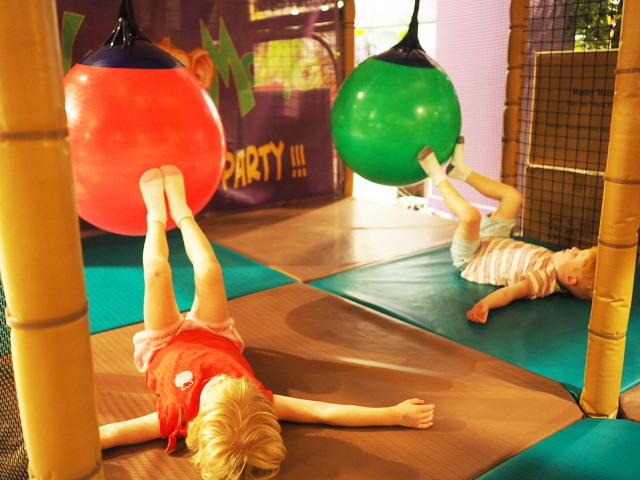 Children 4 years+ will love the Explorer Zone - they can jump and play in the ball pit, bounce on a corner trampoline, climb their way up to the second level and bounce off up there, swing off large mesh balls and more. They will also enjoy the little 'garden' space on the right of the ball pit where they can play with pretend dirt and go through tunnels. There is also a climbing structure located next to that space with a slide against the wall where the rainbow starts. 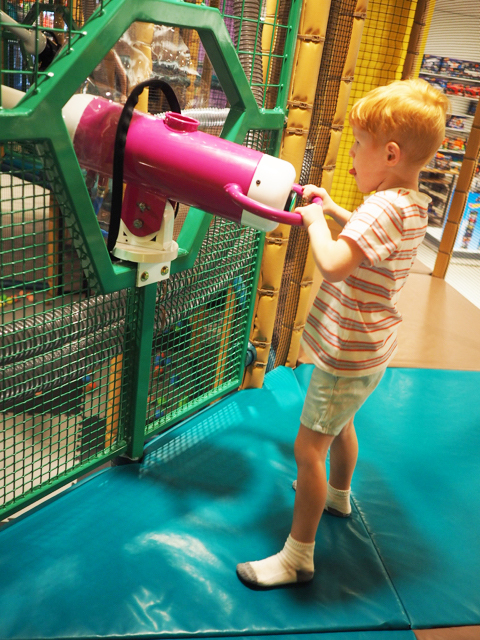 They will love the second section of the Explorer Zone where they can use slides to slide into the ball pit, play with rubber balls and shoot into a games' wall and climb upstairs into the space zone and shoot with ball guns and go down a metal slide. Little ones under four years old will love the Toddler Zone - they will love playing the piano floor, play in the little playground, the ball pit, bouncers, play with shapes and enjoy the vintage free car rides. 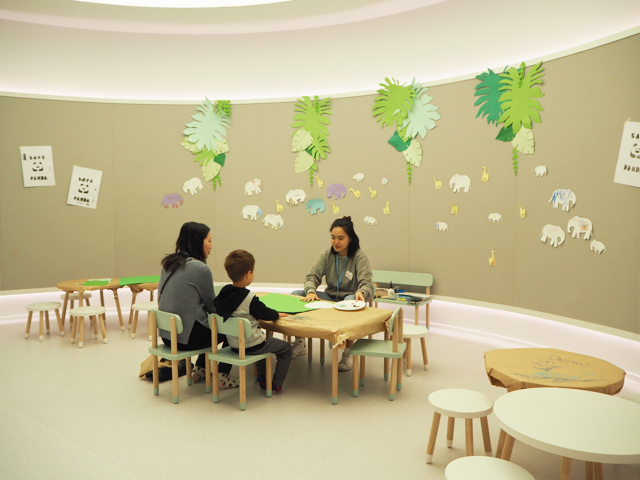 Parents can 'recharge' in the recharge café located next to the Toddler Zone. RFID wristband technology is available for parents if they wish to recharge while their children are safe & secure in the play zones. A number of staff supervise children during their play. The Explorer Zone for kids over 4 does not need parental supervision however myself and my husband wanted to join in the fun too and allow little Mister 2 to join in the fun with his sister even though the space is designed for older kids. This meant that we had to be mindful as some spaces like the little 'garden space' was challenging for him and he almost lost his balance standing on a mound like his sister but luckily a staff member who was closer than I was grabbed him quickly for me. Themed spaces like Muddy, Stage, Bake and Party Room supplement the Buds play zones. Muddy is for budding artists who like to make a splash, Stage is a music studio for young performers, Bake is a fully equipped cooking classroom for children & parents and Party Room is an interactive space for celebrations. Activities are charged separately. Visitors can have fun outdoors amongst the hotel lush gardens with a giant pirate structure fitted with challenging climbs and slides in the Outdoor Playground and cool down in the Water Play Zone euqppied with splash pads. They can also enjoy the free-form outdoor swimming pool located in the centre of the hotel property, with its wading area and jet fountain. We really enjoyed our time at Buds by Shangri-La! What an amazing space for hotel guests and non hotel guests to enjoy. Shangri-La is such a beautiful hotel, wish we had stayed there - time to organise another holiday ha! Buds by Shangri-La is located inside Shangri-La Hotel at 22 Orange Grove Rd, Orchard Road, Singapore. Buds by Shangri-La Indoor is open Mon-Sun from 9am to 9pm and Outdoor is open Mon-Sun from 9am to 7pm. Head to the Tower Wing, Level 1, Adjacent to The Line, Pool & Health Club to get to Buds Indoor first. There are custom designed children's toilets inside Buds and a nursing room opposite Buds' entrance as well as toilets. There is a Recharge Café for parents inside Buds. Parents can recharge with RFID wristband technology to keep their children safe & secure. Buds cannot accommodate for prams inside the centre due to space restrictions. Grab a carrier if you have a little one with you that needs to nap during their brother/sister plays. Kids must wear anti-slip socks for safety at all times. Kids will not be allowed to play or go in the ball pit without socks. You can purchase socks at reception if needed. Adults can use slippers provided but cannot access the ball pit without socks on. Admission prices vary - hotel guests of Themed Family Suites and Family Deluxe Rooms get in for free, entry for other hotel guests varies from $18 to $28 per chid (includes entry for one adult) and entry for non hotel guests (includes entry for one adult) varies from $28 to $48 for three hours. Activities are charged separately. Bring a hat, sunscreen, insect repellent for mosquitoes, water bottles, as well as swimmers (tops and bottoms) for both kids & adults, swimming nappies (if needed), a change of clothes if you are heading in the Outdoor playground and Water play zone. Water and baby milk is allowed inside Buds however outside food is not allowed. Buds admits Children 0 to 12 years old. Children under 4 need to be supervised by an adult at all times. Adults are not allowed at Buds without a child. Busy City Kids were invited to Buds by Shangri-La Singapore for the purposes of a review. All opinions & feedback are genuine & truthful. Travel was self funded. To read our other Singapore reviews, head here. To read our review of the latest Funtopia - Fit & Fun For Mums, Dads & Bubs program, head to this link. 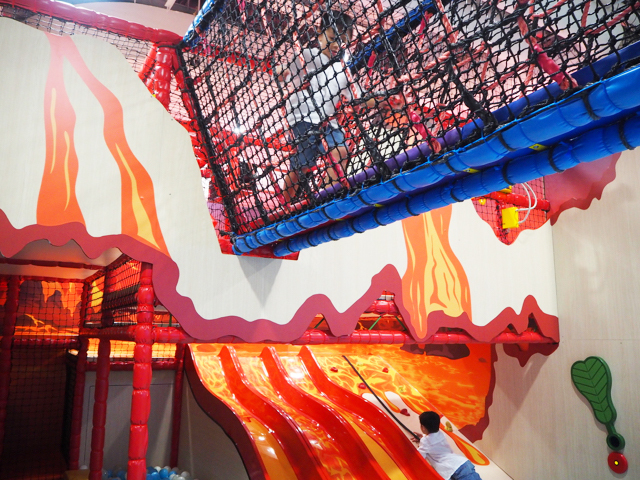 Funtopia Maribyrnong is located at 98 Hampstead Road in Maidstone near Highpoint Shopping Centre and is a large indoor rock climbing center which has two worlds - Playground World and Climbing World. Oh and of course, there’s a café connected to the venue - Mr Spriggins! 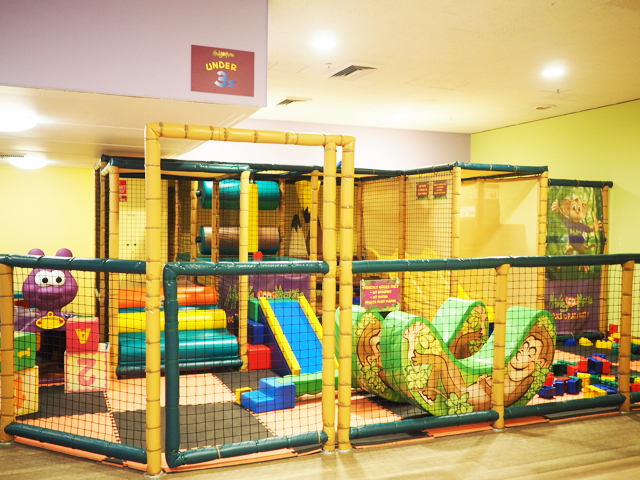 Playground World features 650 sqm of play space which includes an area for toddlers. It is both educational and fun and features Australian icons like the Sydney Harbour Bridge, Uluru, the Great Barrier Reef and even a giant Melbourne tram! Climbing World has a crazy 40 interactive climbing walls with challenges for beginners and climbing pros. 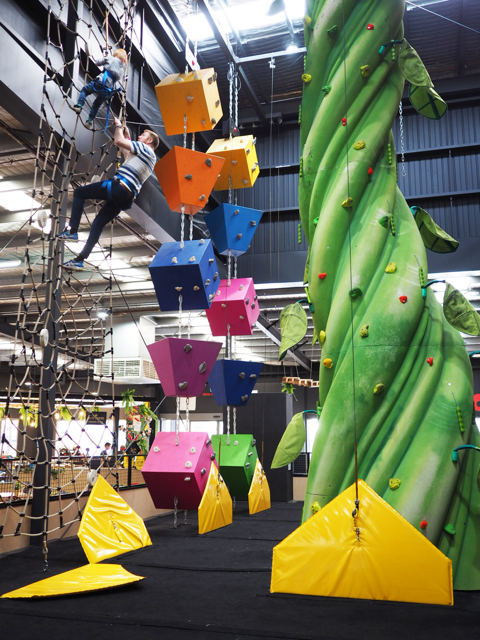 The climbing walls are all different, there's a jump and a giant drop slide but most of all the kids (and you) must experience the giant beanstalk! Kel's little Rav studied the giant beanstalk for hours before Mena took the plunge and climbed up hah! 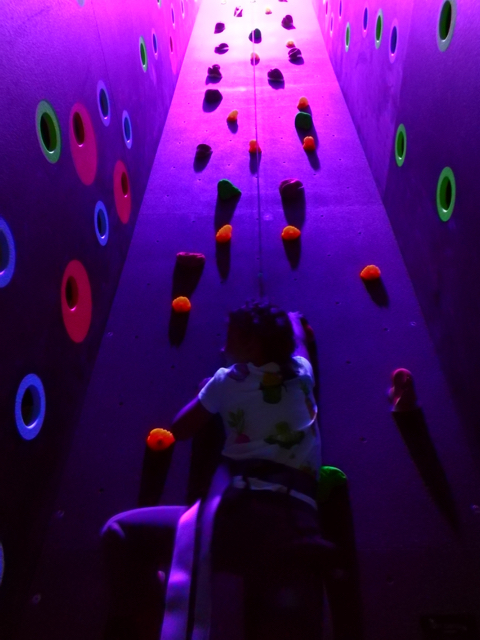 Mena loved climbing all the different obstacles, it sure does look like a lot of fun and perfect for birthday parties and no doubt adults can have all the fun too! Funtopia Maribyrnong opens this Wednesday 30th August. 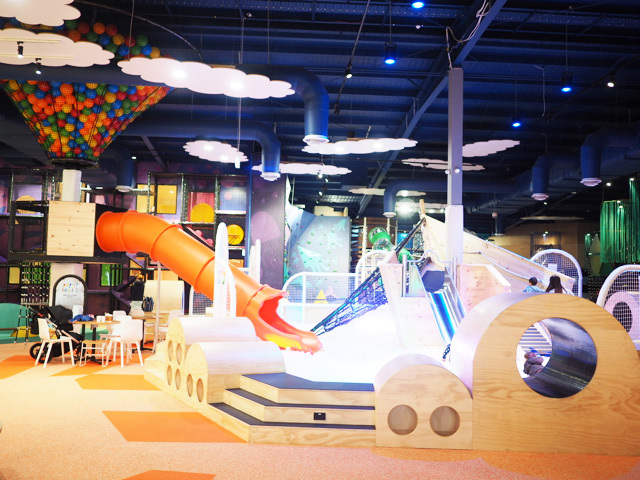 For more information and to stay up-to-date with Funtopia Maribyrnong, checkout their website.